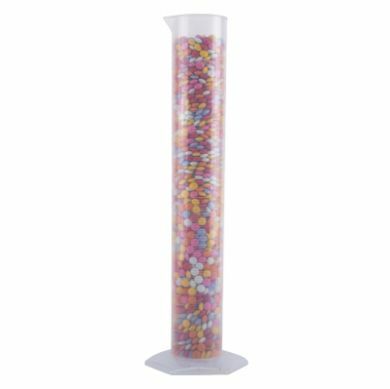 Budget Polypropylene 500ml graduated plastic measuring cylinder, made from polypropylene, good chemical resistance, autoclavable with pouring spout. Graduations embossed onto the plastic every 5ml. Please note that the graduations are embossed and not printed. These plastic cylinders are our budget range - the injection moulding of the bottom of the cylinder is poorly finished which means some liquid can remain in crevices. Diameter of top (rim outer): 57mm. Diameter of body (Outside Diameter): 54mm. Point to point Base width: 107mm. 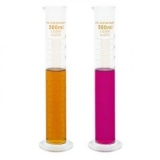 Graduations Numbered at: 50ml, 100ml, 150ml, 200ml, 250ml, 300ml, 350ml, 400ml, 450ml, 500ml.